The Ornate Ghost Pipefish has the word “Ornate” in its name. This one was found in Puerto Galera, Philippines. 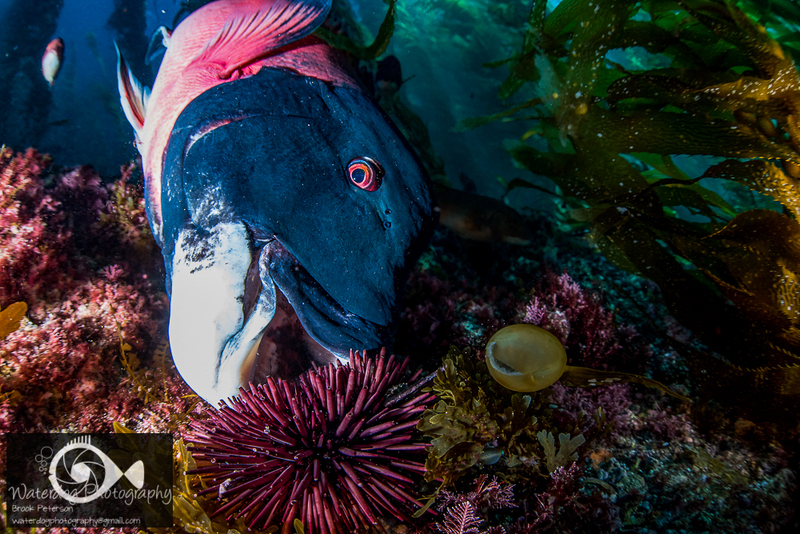 If you enjoy my images please visit my website, waterdogphotography.com, or give me a like on facebook at Waterdog Photography Brook Peterson. Don’t forget to follow me here at waterdogphotographyblog! 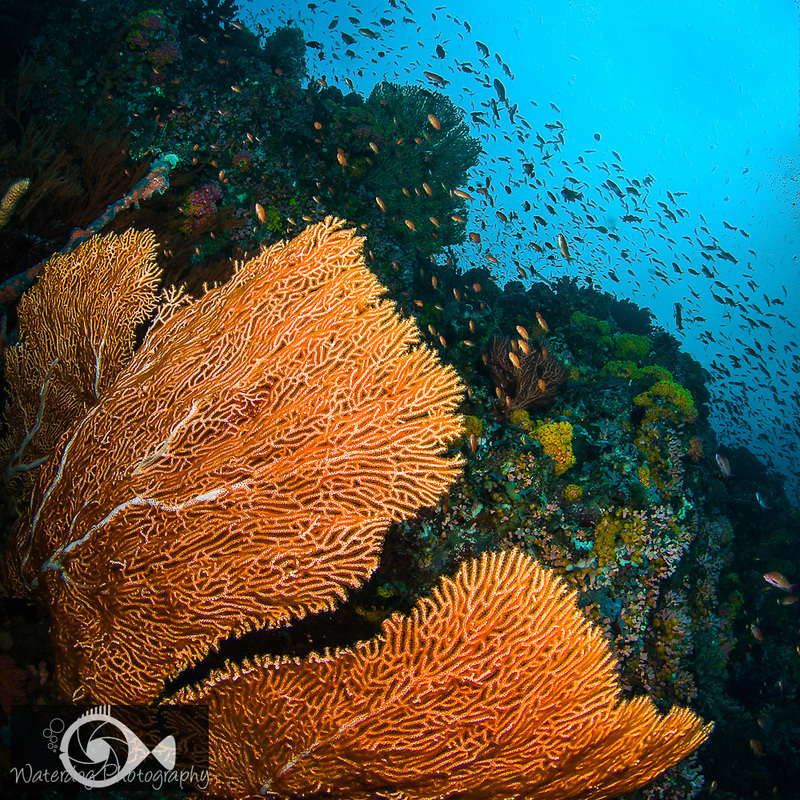 My photographs are taken with a Nikon D7000 or D810 in Sea and Sea Housing using two YS-D1 Strobes. 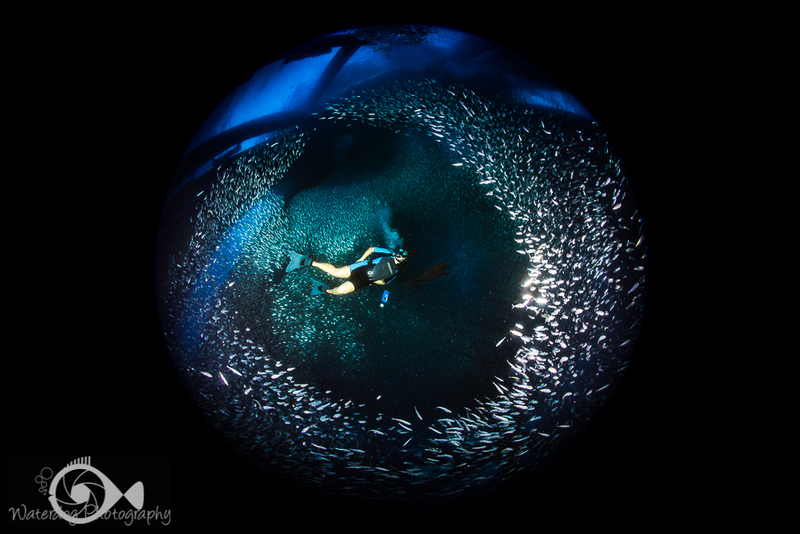 People often ask what the best camera is for underwater photography. Chase Jarvis said, “The best camera is the one that’s with you.” I do believe that is true. 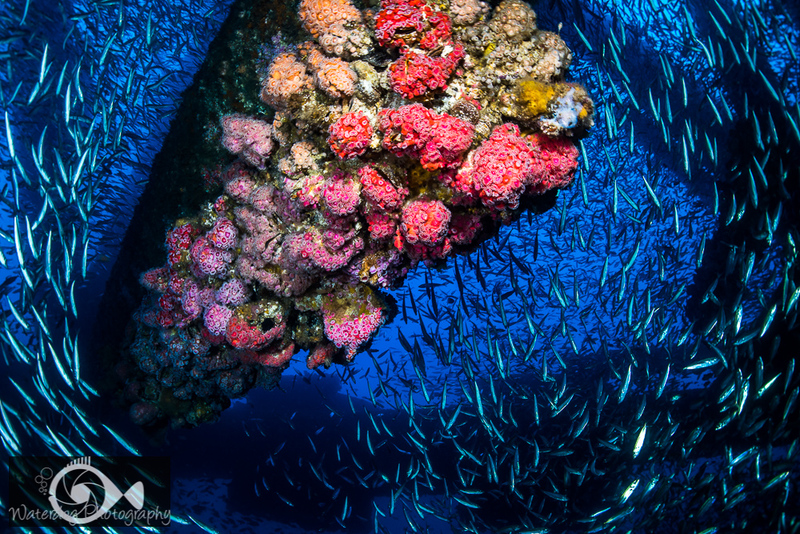 When I first started shooting images underwater, I had no idea what a good snapshot should look like, let alone how to get that image. 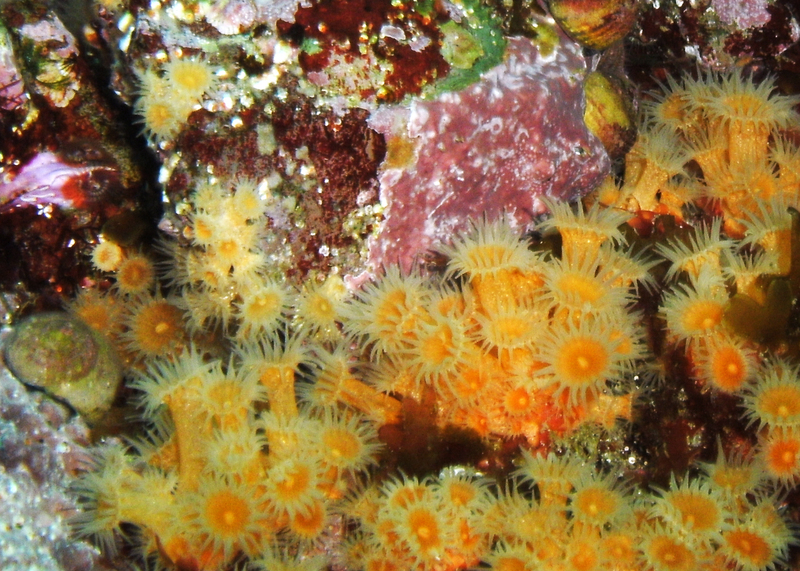 I started my underwater photographic journey with a compact camera, that was made for underwater photography. It had a setting for blue water, and one for green water, and an on-board flash. The above image was taken with my new compact camera on its maiden voyage (or dive) which also happened to be my first dive after certifying. It isn’t horrible, but I sure could have used some pointers back then. Later I learned the importance of good lighting and I added a strobe to my compact camera. Good lighting makes a big difference as you can see from the above photo in my first effort using a strobe. After a year of experimenting with my compact camera and strobe, I began to master some of the basics and my desire for a DSLR camera became stronger. 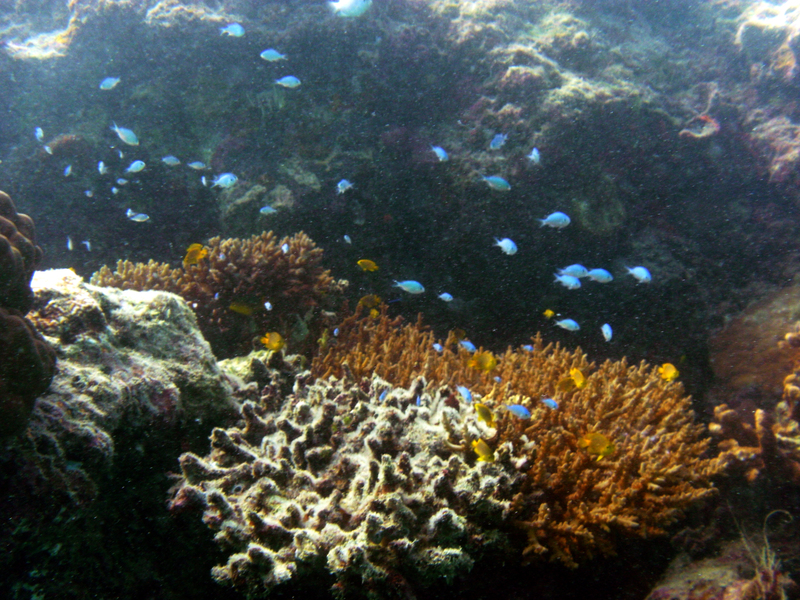 The next image was taken on my new DSLR’s maiden dive. You can see that there is improvement in the clarity and composition of this image. My point in showing off my first efforts with underwater photography is to demonstrate that I had a lot to learn in the beginning, and after a couple of years of practicing, I got better. But I didn’t simply get better. 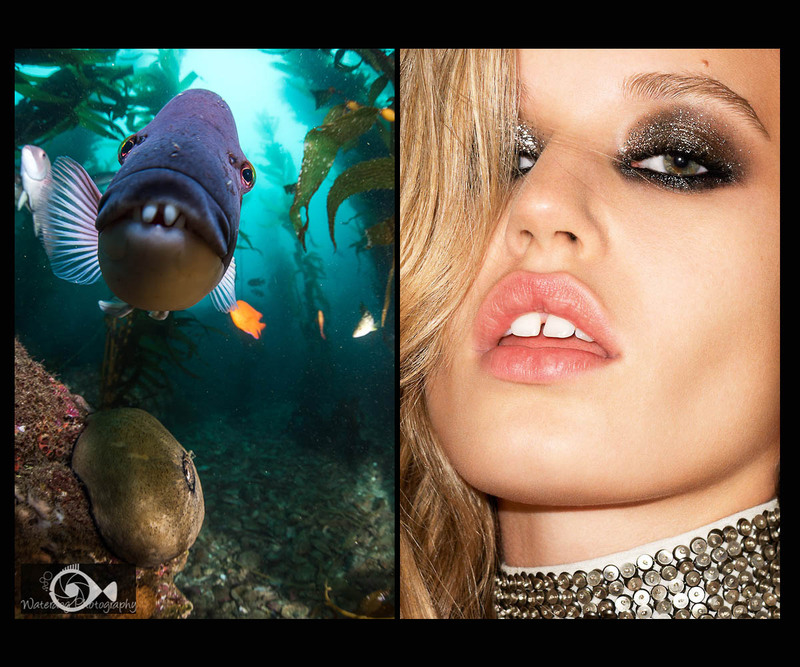 I studied other images by well known underwater photographers. I read books on underwater photography and took both private and group classes with underwater photography instructors. I found some mentors and I asked them a lot of questions and I asked them for critiques of my work. Eventually, I began to take images that I am now proud to put my name on. 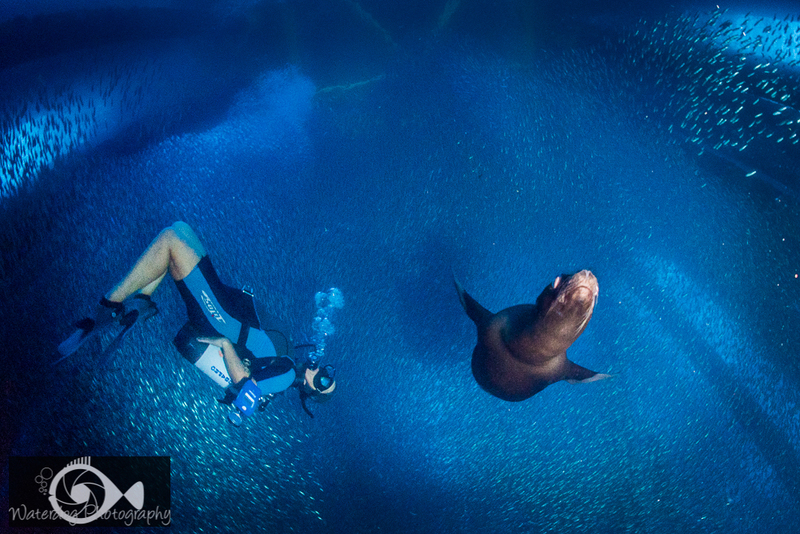 Fortunately for beginning underwater photographers, there is help! I recently became acquainted with Matt Smith who has created a great info-graphic for beginning underwater photographers. You can read his blog here. At the end of the info-graphic, there is a list of resources you can use to further your study in underwater photography. Most of them were sources I used when I was learning. 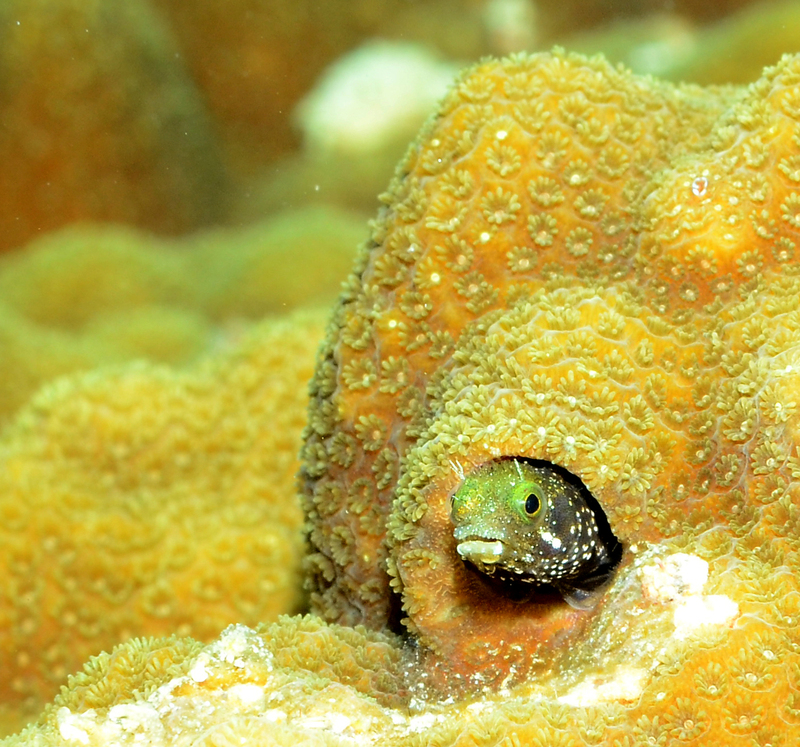 One of the most valuable of these was Underwater Photography Guide , an online resource center with lots of accomplished photographers who contribute articles on mastering underwater photography techniques. In addition to these, I joined some underwater photography groups on Facebook where I could see what other photographers were doing. 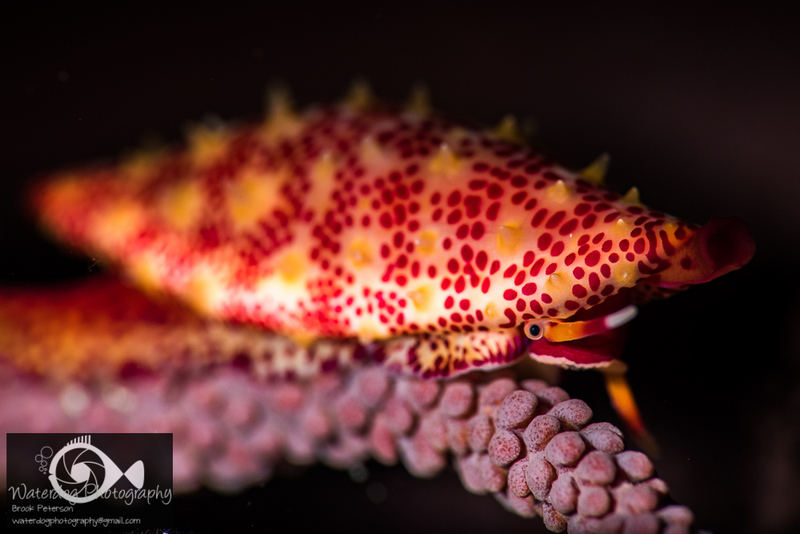 Wetpixel and Underwater Macro Photographers boast some wonderful photography on Facebook. 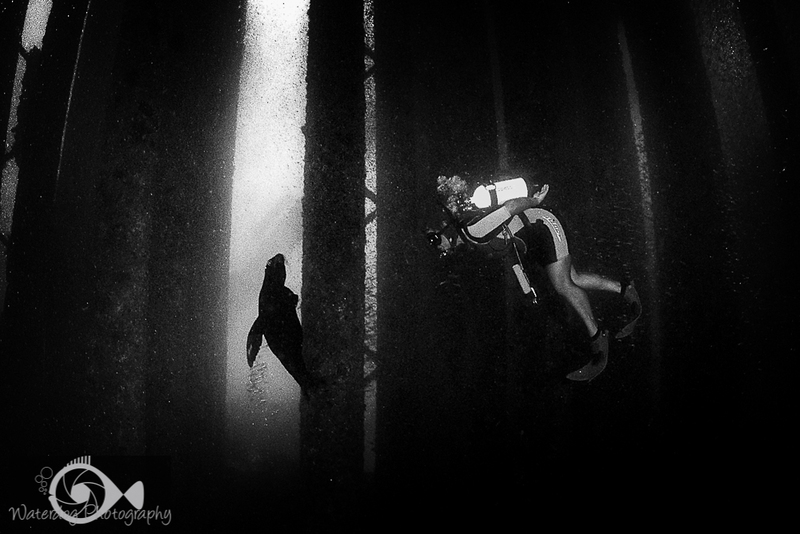 So as you progress through your journey in underwater photography, don’t get discouraged. It is a lot to learn, but there is a lot of help out there. 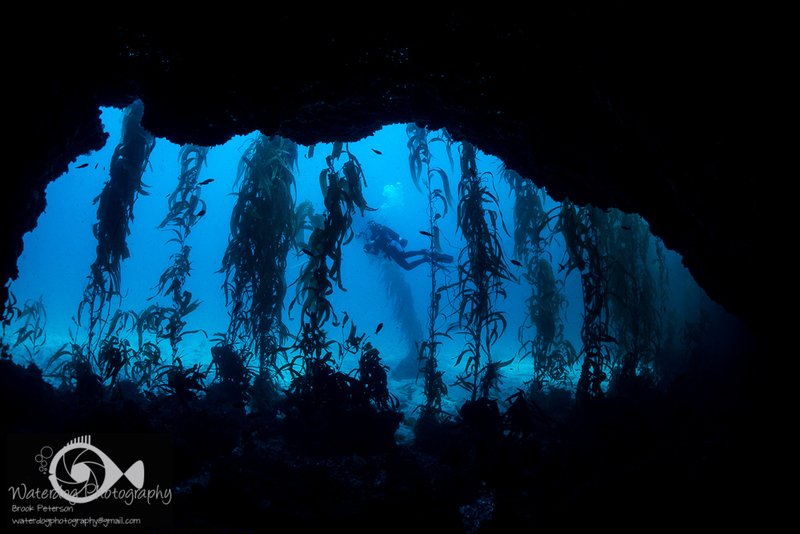 Check out my “Underwater Photography 101” series and accompanying You Tube tutorials for more information. 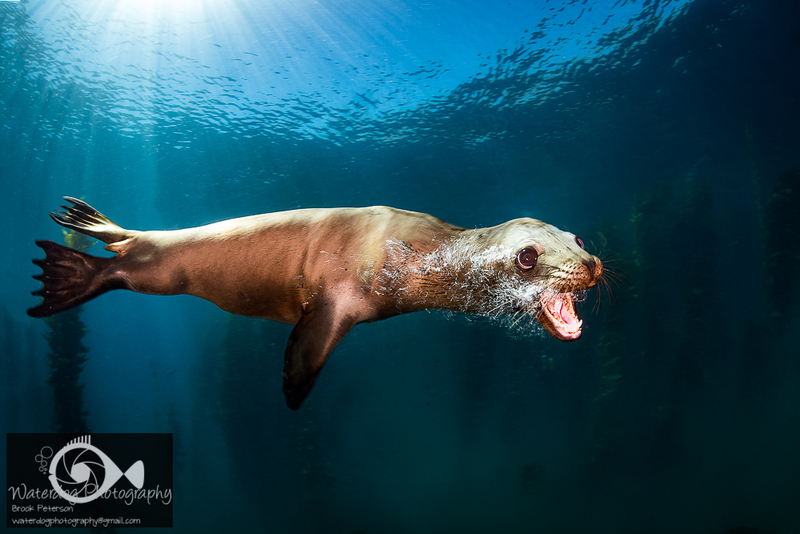 If you have questions, or suggestions for underwater photography tips, please feel free to leave comments below. As always, if you enjoy my images please visit my website, waterdogphotography.com, or give me a like on facebook at Waterdog Photography Brook Peterson. Don’t forget to follow me here at waterdogphotographyblog! David Copperfield said, “The real secret of magic lies in the performance.” It seems like that would be a fitting slogan for Magic Filters; filters created with a specific color formula for underwater digital photography using available light and no strobes. Having been introduced to the filters by their creators, I got to experience their very contagious enthusiasm for the magic the filters create. I have to say it was refreshing and exciting to add this technique to my tool bag and hope the following images will spark your interest too! The first thing you will notice about these images is that the color and light are consistent throughout the image. That is because there is no strobe lighting the foreground. Instead, ambient light is used and the image is evenly lit by the sun. This subject is approximately 35 feet under water, so without a strobe, and without a filter, the image would be very blue. Magic Filters are formulated for blue water or green water and have a specific color formula that adds the appropriate shades of red back into the image. The photographer must take a manual white balance and exposure reading on the subject before shooting, and the filter does the rest. One of the things that I liked about using the filters is that they show the scene underwater the same way my eyes see it. 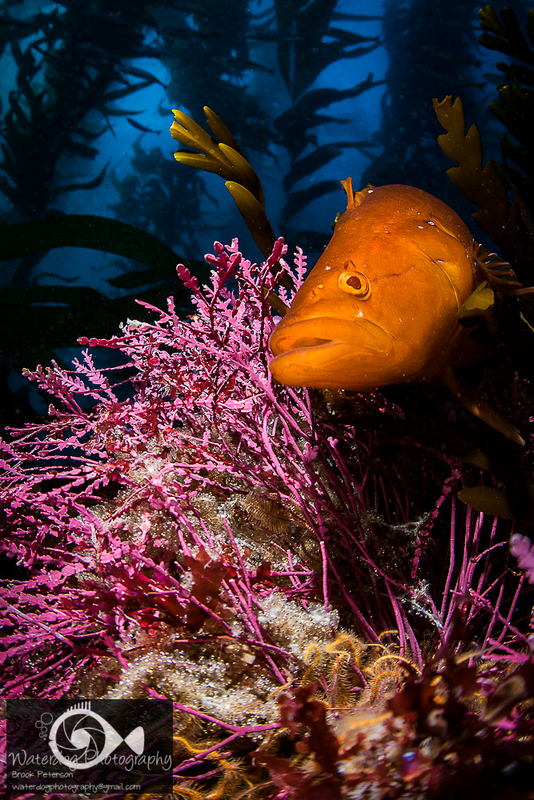 The Garibaldi in the image above is a brightly colored fish and when lit with strobes it sometimes glows so bright it becomes a distraction. 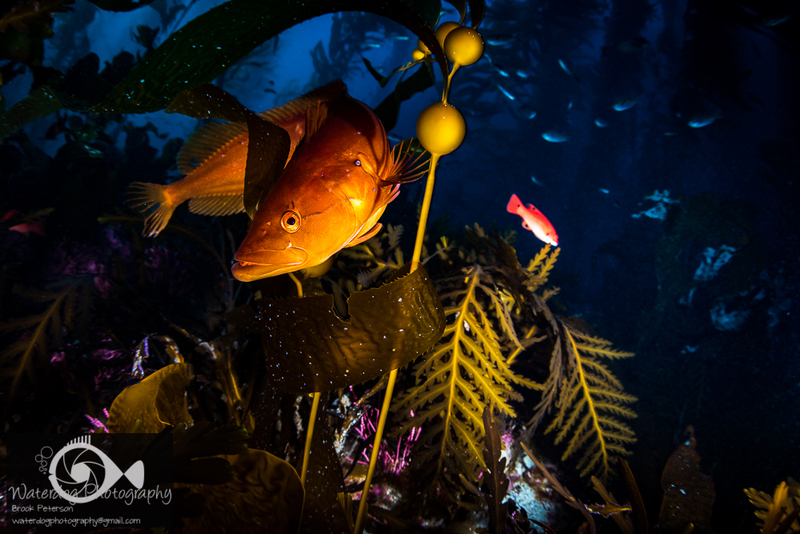 It is also very hard to light kelp with a strobe because it absorbs the light and often comes out looking very yellow or very green. 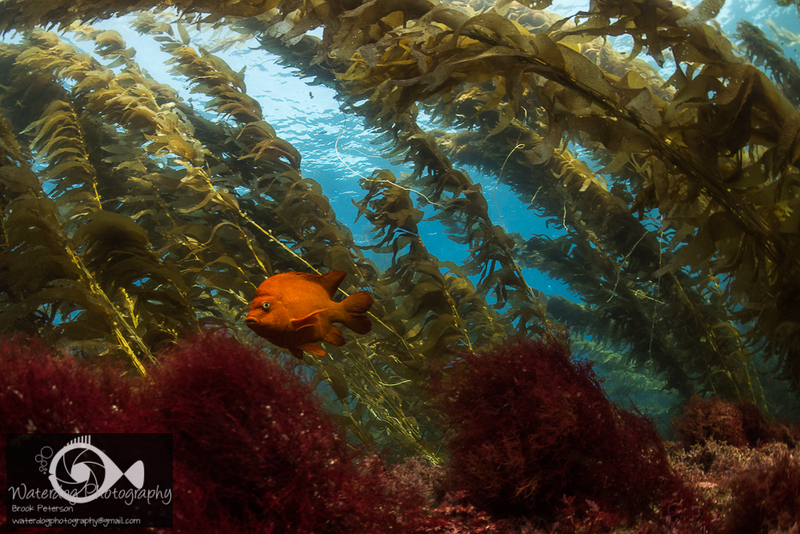 This image shows the kelp’s true color. The color of my skin in this image is corrected by the filter almost to perfection. The light you see on my face is from the sun and I am in 30 feet of water. Without the filter, this image would be almost completely blue. 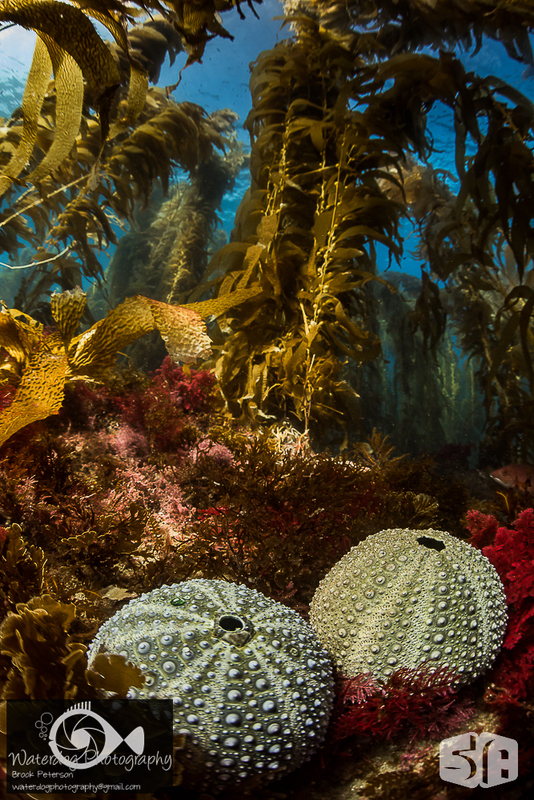 I wouldn’t shoot every image with the Magic Filters, but it sure is a great tool to have in some situations and it gives a bit of diversity to an underwater portfolio. For more information on the filters visit http://www.magic-filters.com and enjoy the magic! As always, if you enjoy my images please visit my website, waterdogphotography.com, or give me a like on facebook at Waterdog Photography Brook Peterson. Don’t forget to follow me here at waterdogphotographyblog and please feel free to share on Facebook or other social media. 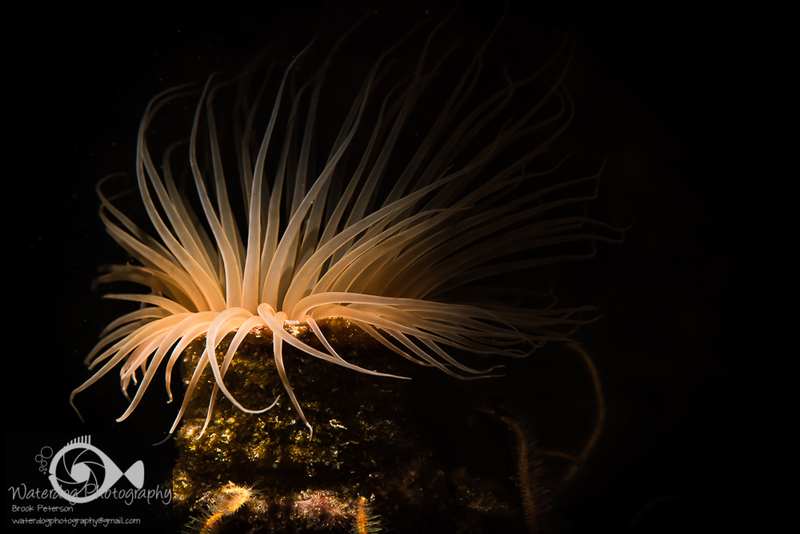 My photographs are taken with a Nikon D810 in Sea and Sea Housing using two YS-D1 Strobes. 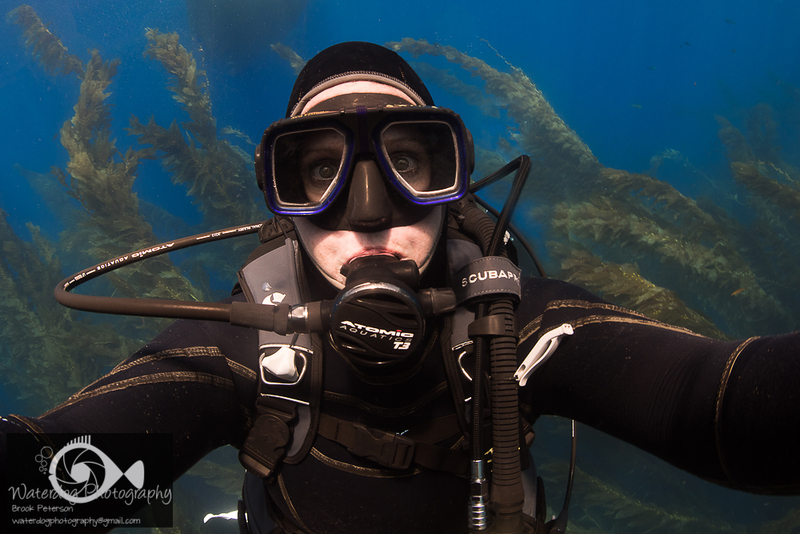 This post is completely self-indulgent, but I guess when you think about it, the whole idea of writing a blog about my own underwater photography is pretty egocentric. 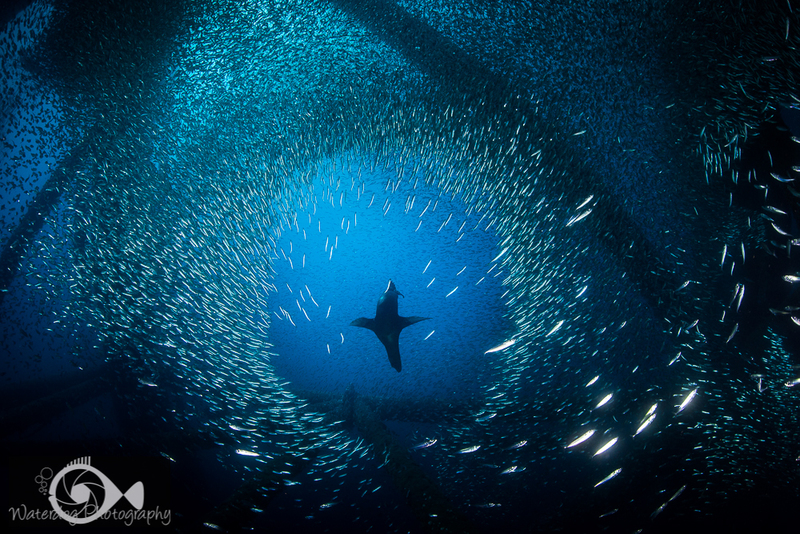 I recently entered an underwater photography contest in which several of my images placed. So just to drive the whole ego-related point home, You can see the winners and the losers below. The contest is a local “shootout” in Southern California, known as the So Cal Shootout. 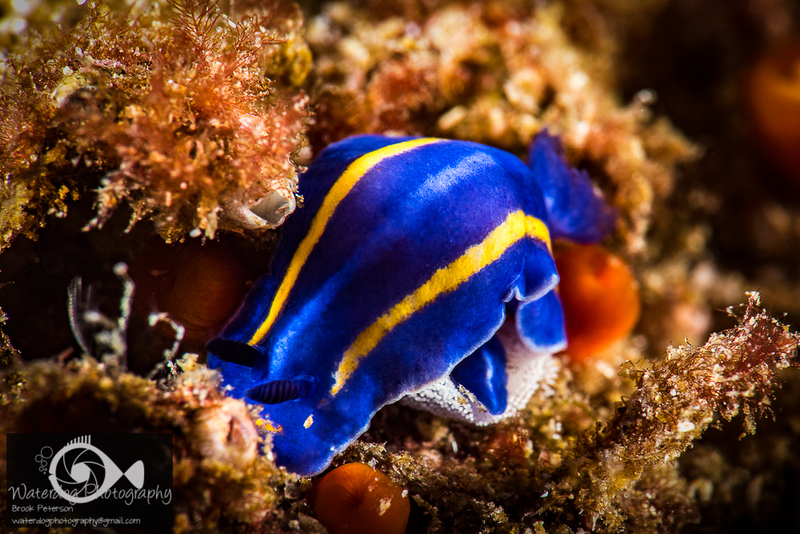 Underwater Photographers have three days to capture images and submit them for judgement. There are lots of categories and lots of prizes and most people go home happy, even if they don’t have a winning image because it is always fun to scuba dive with friends. The blue ribbon eel is one of the most fascinating creatures of change. All of the ribbon eels are born male. Toward the last year of their life, they may begin to turn yellow, and also turn into a female. 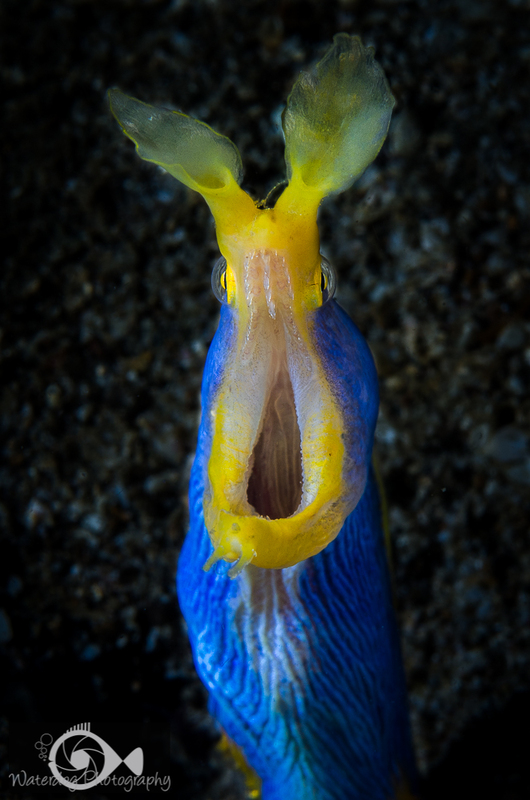 All yellow ribbon eels are female, and all blue ribbon eels are male. 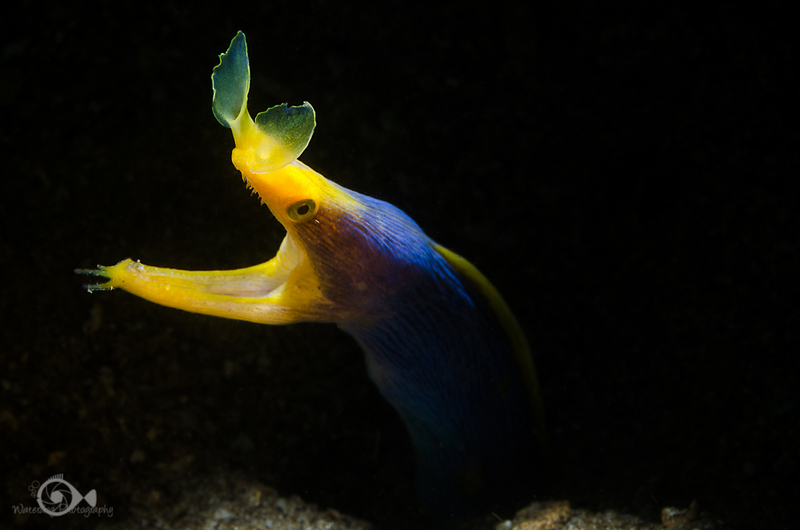 A female ribbon eel will procreate after she has changed, and then die, so it is very rare to see a yellow ribbon eel. 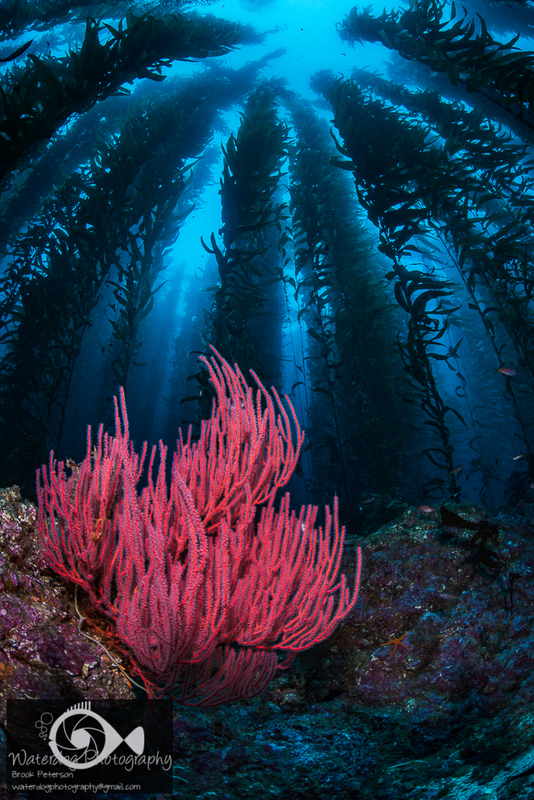 Once a year, for a few weeks, there is a special underwater convention held under the oil rigs in Southern California. All marine animals are invited and the event is consistently sold out. I’m being facetious of course, but truthfully, there is an eco-palooza going on under the oil rigs along Southern California’s coast. 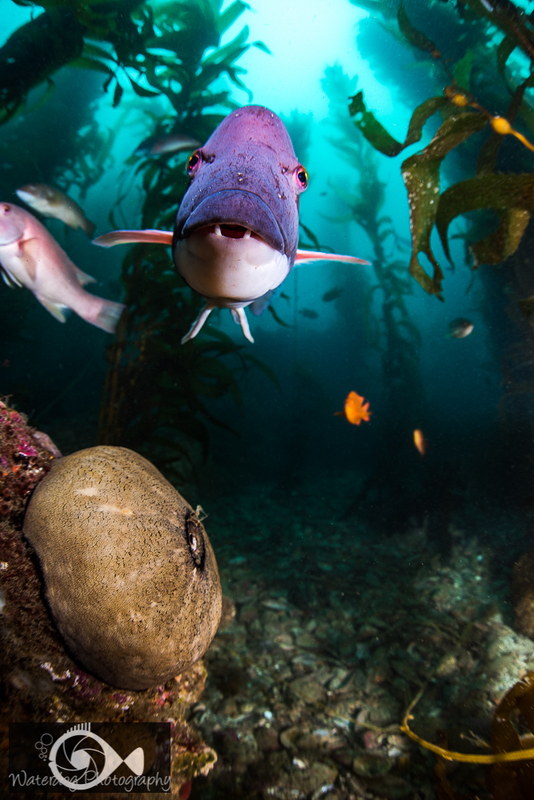 The “El-Nino” conditions have kept the west coast waters toasty warm and scuba divers get to see first hand the effect it has on marine life. 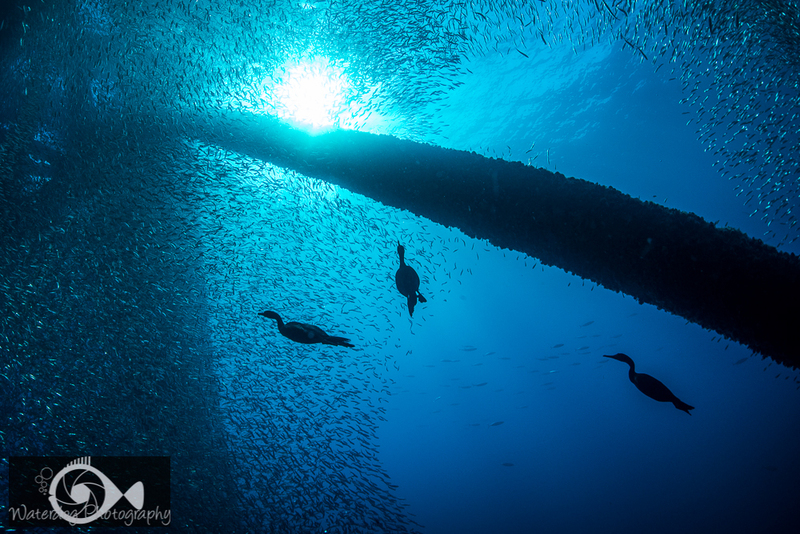 The first thing a diver will notice when diving under one of the off-coast oil rigs, is the HUGE number of bait fish taking advantage of the cover and protection of the rigs. 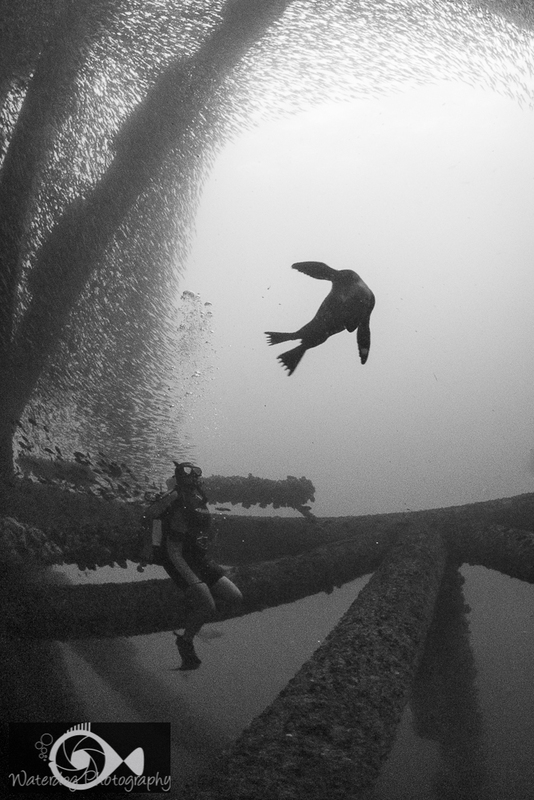 Since the rigs are in open water (about 8 miles from shore), their support structures provide an artificial reef for marine life. 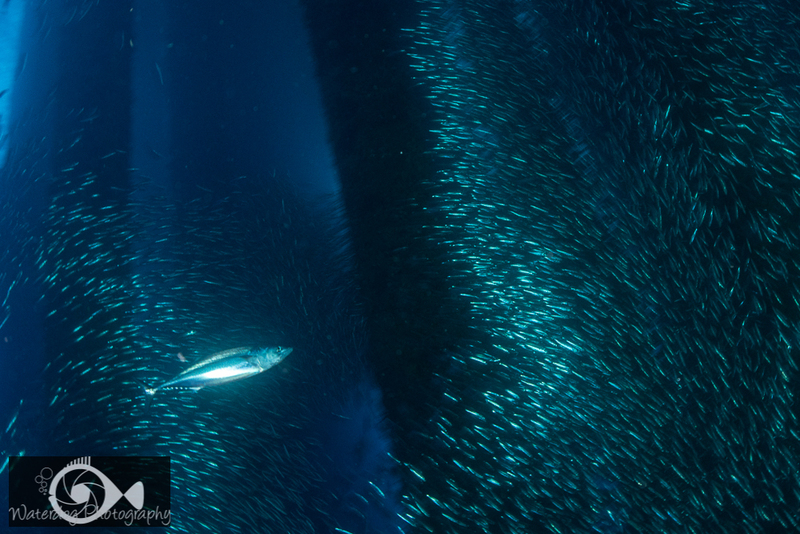 Bonito patrol around the outside of the structure occasionally picking off one of the bait fish. This effectively encourages the bait fish to remain inside the confines of the oil rigs support columns. Suddenly the fish begin to move in a synchronized pattern as a sea lion comes down for his breakfast. Once the dinner-bell sounds, the cormorants come around looking for their next meal. Sometimes it is just fun to sit down and watch the show. Apparently, the sea lions like an interactive show. This little pup came around for about 15 minutes and tried to feed us fish it caught, posed for the camera, and did acrobatics with the divers. 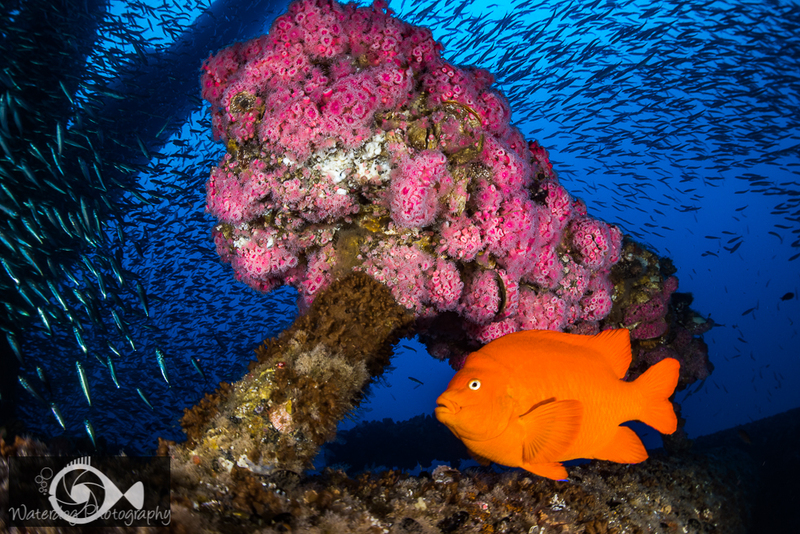 Since the structure provides an artificial reef, there are Garibaldi, sea stars, anemones in vivid pinks, oranges and yellows, and many scallops, and invertebrates on the support columns. Unfortunately for us scuba divers, our time is limited under water and all too soon it is time to go back to the surface. 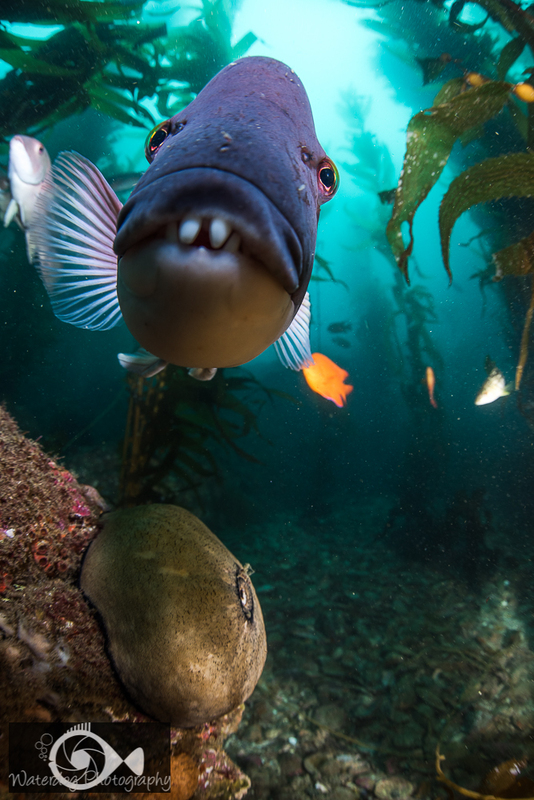 Just for fun last week, I posted a photograph of a fish that had moved too close to my camera and pressed it’s mouth up against the glass dome of my camera housing. It wasn’t the most technically precise image, but it sure got a lot of attention. Marinebio.org an organization focused on marine conservation, shared the image to their facebook page. Within a few hours I had an inbox full of messages (more than 250) from others who had shared the image. In addition, there were over 4000 likes and 100 comments posted. I was completely flabbergasted, and kicking myself for not putting my web address on the original post. Part of the reason I share this story is to point out that beauty is certainly in the eye of the beholder and humor is all in our perspective.